The province of San José (a prime area) is situated in the Central Valley, whose territory includes forests, volcanoes and mountains. San José has a mild to moderate climate characteristic of spring, and its rich volcanic soil produces some of the world’s best coffees. First settled during colonization, San José is the most densely populated region in the country. Its present population is expected to rise even more as it continues to lure expats to buy or build homes here. The capital city of San José is not the best choice for living. Heavy traffic, air and noise pollution, and street crimes bedevil residents and visitors. Yet the city is quite cosmopolitan, with elegant hotels and nice restaurants serving international cuisines. Downtown, there are many historic buildings, plazas and parks. La Sabana Park, where San José’s main airport was once located, is the province’s largest public park. It has lakes, ponds, and recreational facilities. The park is surrounded by upscale neighbourhoods. Rohrmoser is a middle-to-upper class district where embassies and many business establishments are located. The very posh Escazú is the address of choice of wealthy locals and foreign diplomats. Gated communities dominate downtown Santa Ana, which is less developed than Escazú and has more low cost housing. Los Yoses is a middle-to-upper class neighbourhood with some affordable housing. Neighbourhoods such as Curridabat, Pavas, San Franciso de Dos Rios, and Zapote also have inexpensive housing available. Pavas, however, has notorious slums. Escazú sits on the slopes of the mountain range of the same name. It is cooler here than in San José, and it is probably the most exclusive place in Costa Rica. Escazú has elegant homes and country estates, high-rise condominiums, luxury hotels, country clubs, excellent medical and dental offices, a prestigious English language school and several private schools. There are chic and trendy shops, restaurants and bars, banks, supermarkets, grocery stores, and pharmacies, movie theatres, a bowling alley, and an 18-hole golf course. The main road leading to the neighbourhood is lined with international restaurants and fast food outlets, most of which are American franchises. Escazú has always been the preferred choice of wealthy Costa Ricans. These residents are now joined by rich expats, particularly North Americans and Europeans, as several foreign embassies and ambassadors’ homes are here. The city has three main neighbourhoods: San Antonio, San Rafael, and Escazú Centro. The latter has a more rural appeal, with single-family homes and narrow, not-so-busy streets. San Rafael and San Antonio are somewhat more upmarket. The upscale and very secure neighbourhood of Trejos Montealegre is home to many foreign diplomats. The old road that passes through Escazú leads to the pretty suburb of Santa Ana. Santa Ana has many beautiful homes, with more reasonable price tags compared to homes in Escazú. Gated communities such as the exclusive Parque Valle del Sol attract middle-to-upper-class locals and foreigners. Santa Ana is less developed than Escazú, but has hotels, grocery stores, supermarkets, restaurants, cafés, shops, medical and dental clinics and private schools. It has easy access to the new highway, and is not far from CIMA Hospital and the Multiplaza shopping mall. Santa Ana continues to experience growth in residential and commercial development, but manages to retain its laid-back pace. Further east of downtown San José is the upscale neighbourhood of Curridabat. Luxury condominiums and houses here go for a lower price than similar properties in Escazú. 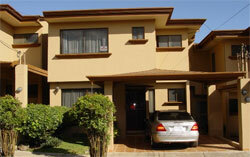 There are nice single-level homes and condos offered in Pinares, which is close by. In some areas, inexpensive housing is offered. There are some commercial buildings in Curridabat, such as the single-level Plaza del Sol, which has several shops and a supermarket, and the newly built Terra Mall, which has international brand stores and fast food chains, 15 cinema screens, and a large department store. The Multiplaza del Este between Curridabat and Zapote, another middle-class neighbourhood, has luxury boutiques, cinemas, a food court, and supermarket. On the site of an old airfield is La Sabana Park, one of San José’s most serene and attractive places and the largest urban park in the province. La Sabana has an artificial lake, fountains and ponds. There are playgrounds, jogging trails, soccer fields, a stadium, an Olympic-size pool, and many sports and recreational facilities. The park’s grounds are great for picnics and concerts. It is the site of the Museum of Costa Rican Art, which exhibits paintings by contemporary artists. The spacious park is the main attraction for the residential development in the nearby upscale neighbourhood, also called La Sabana. This area is favoured by North Americans. There are condominiums and offices for sale and rent in Sabana Norte and Sabana Sur. There are hotels, restaurants, gyms, stores, and a supermarket in the neighbourhood. Los Yoses is a quiet, middle- to upper-middle-class suburb east of downtown San José. There are bars and restaurants, a well-stocked supermarket, a bowling alley, and a bookstore. The non-profit Costa Rican-North American Cultural Centre exhibits works of international artists and regularly hosts film screenings and music, dance and theatrical performances. The suburb is close to the large, four-level San Pedro Mall, which has a movie theatre complex and complete workout facilities. Las Yoses has beautiful homes, particularly in posh Barrio Escalante. Many rich Costa Ricans and foreigners live here. Near Los Yoses is San Pedro. This suburb includes the University of Costa Rica. Affordable housing can be found around the university. Many businesses here cater to university students and other young people, and there are several entertainment venues, language schools, and shops. Chaotic traffic, thickly polluted air, and rampant street crime are enough to ward people off San José, Costa Rica’s capital. And as there are now direct flights to Guanacaste’s capital, Liberia, the city has ceased to be the country’s most important transportation hub for tourists. Yet one cannot altogether dismiss San José, which is situated right at the heart of the country. Founded during Costa Rica’s coffee boom, the city still has many working plantations on the mountainsides and downtown. San José can thank the coffee planters who became rich during the boom, as they not only contributed to the city’s economy, but to its historic architecture as well. They built the Teatro Nacional, now recognized as the most beautiful building in the country. The theatre is a major cultural attraction as concerts, theatrical performances, and other events are regularly held here. San José is the only metropolitan city in Costa Rica, and with its pleasant climate, it remains a good choice for those who enjoy an urban lifestyle. The highly commercial suburb of Pavas is home to many middle-class families living in quiet neighbourhoods. Along the main boulevard are the US Embassy, banks, shops, bars, restaurants, and cafés. Pavas has a domestic airport. Rohrmoser is an upmarket suburb, the home of many wealthy Costa Ricans and diplomats. There is a lot of security here, as there are foreign embassies along tree-lined Rohrmoser Boulevard. The neighbourhood has its own park, and homes here are mostly large houses, condominiums and upscale apartments. Rohrmoser is very near Escazú, and benefits from the stores and services available there. The neighbourhood has easy access to the highways as well.